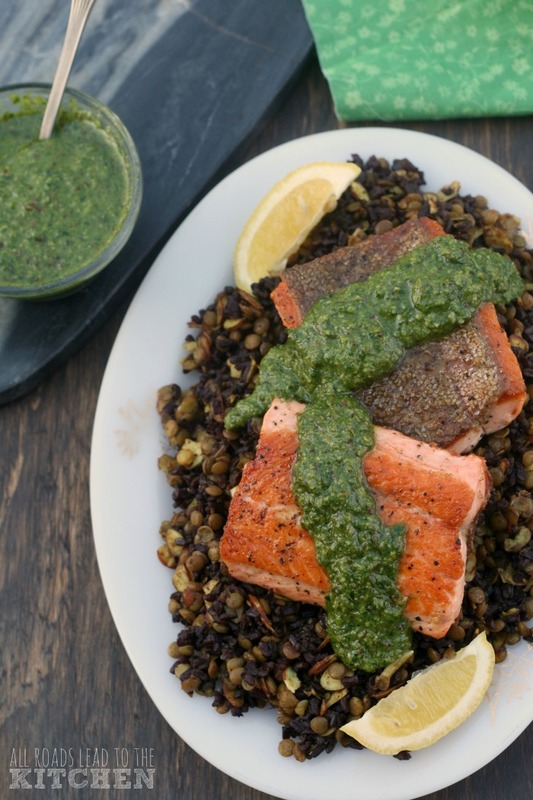 Today is the first Friday of the Lenten season, and in honor of that, Leslie and I are sharing fish and seafood recipes for today's edition of She Made, Ella Hace. So, here's the thing—I wasn't raised Catholic (and I'm not Catholic now), so I've never done the whole abstaining from meat on Fridays during Lent thing. And while my husband was raised Catholic, he's not a practicing Catholic now. That said, I've always been fascinated with the rules and observations of other religions, as a part of culture. So, in high school, I'd watch a lot of my Catholic friends order vegetarian Whoppers at Burger King during our lunch break. I think it was just a Whopper without the beef patty. I've never actually tried one myself (do they still make these, or do they just use veggie burgers now?). I do, however, take full advantage of all of the fish sandwich specials this time of year. But here's what always stumped me—why fish? Isn't fish meat? But apparently, "according to the United States Conference of Catholic Bishops, abstinence laws say meat is considered something that comes only from animals that live on land, like chicken, cows, sheep or pigs" (source: CBS Minnesota). Huh. I've said many times that I would be a pescetarian if it weren't for the fact that bacon was so delicious, so I don't know that I would consider having fish as a meal every Friday very penitent. That probably means I'd have to give up fish for Lent. Quite a conundrum. 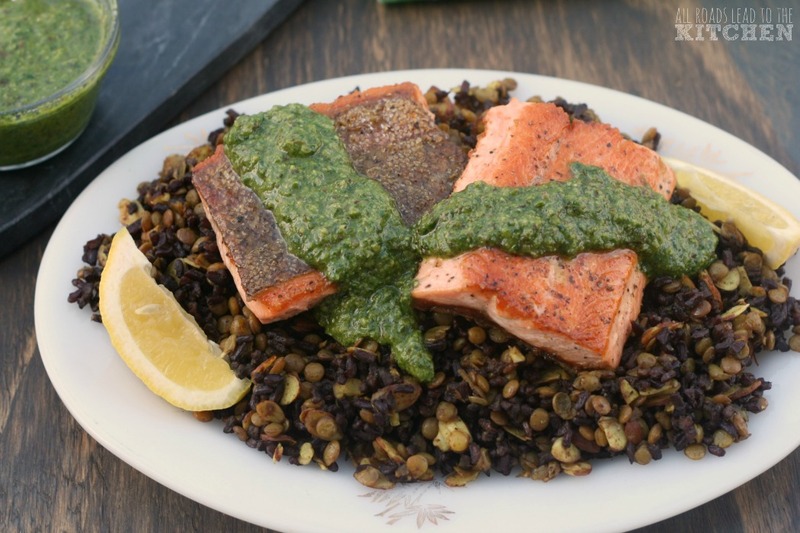 Spicy greens like arugula and mustard make a bright pesto sauce to complement salmon and a healthy lentil and black rice salad. Cook the lentils and the rice separately according to package directions. Whisk olive oil, lemon juice and turmeric with a pinch of salt and pepper. Toss with the rice, lentils and almonds; taste and adjust seasoning as needed. Pulse the almonds in a food processor until coarsely ground. Add the greens and miso; process until greens are coarsely chopped. With the processor running, slowly pour in the olive oil and process until smooth. Season the pesto to taste. Season the salmon lightly with salt and pepper. Heat oil in a pan over medium heat. Add the salmon to the skillet, skin side down. 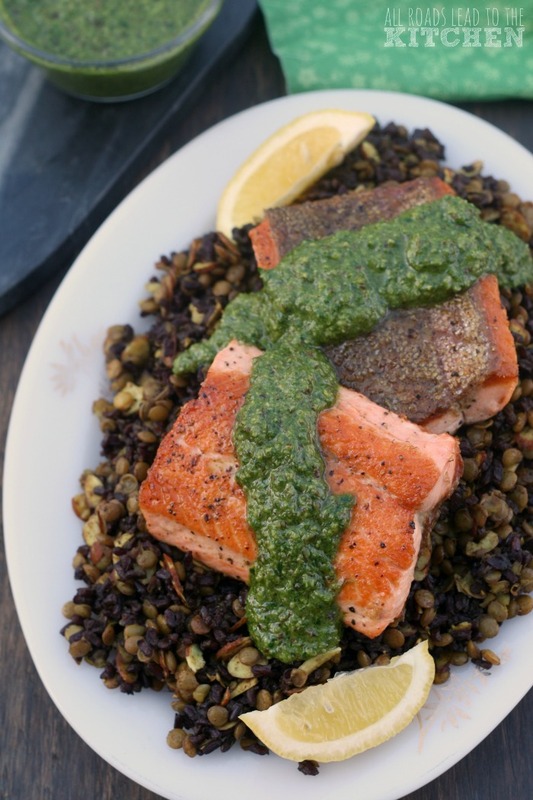 Cook without moving the salmon until the skin is browned, 5-6 minutes. Turn and cook until the salmon is just flaky in the center, 2-3 minutes longer. 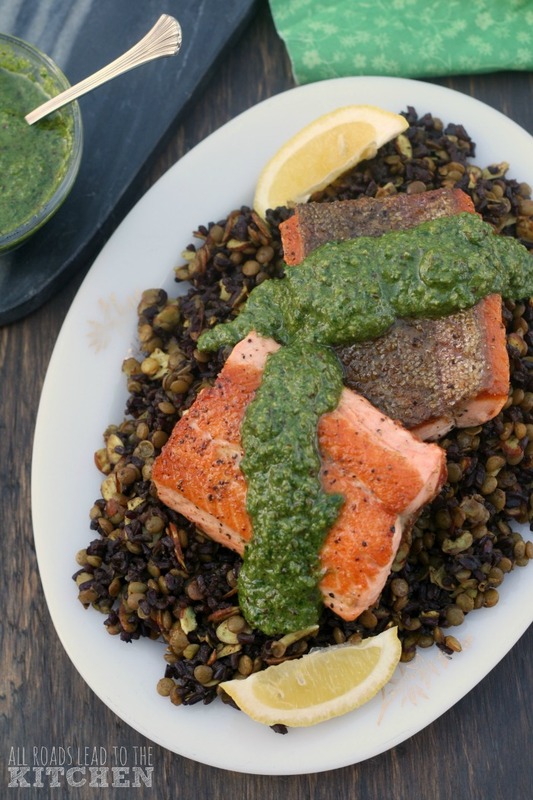 Divide the lentil-rice mixture among plates and top with the salmon; drizzle with the pesto. Serve with the lemon wedges. ©All Roads Lead to the Kitchen. Adapted from Rachael Ray.